The seasonally adjusted rate can be slow to capture economic turning points because it is designed to dampen volatility. Other measures, such as the not-seasonally adjusted rate, show the labor market may be softening. The unadjusted statewide rate was 7.3 percent in March, down from February’s 7.7 percent, reflecting the typical seasonal shift. Alaska’s dramatic seasonality makes it nearly impossible to detect underlying trends by comparing two consecutive months, but comparisons to the same period in the previous year show unadjusted rates for the first three months were higher in 2016. 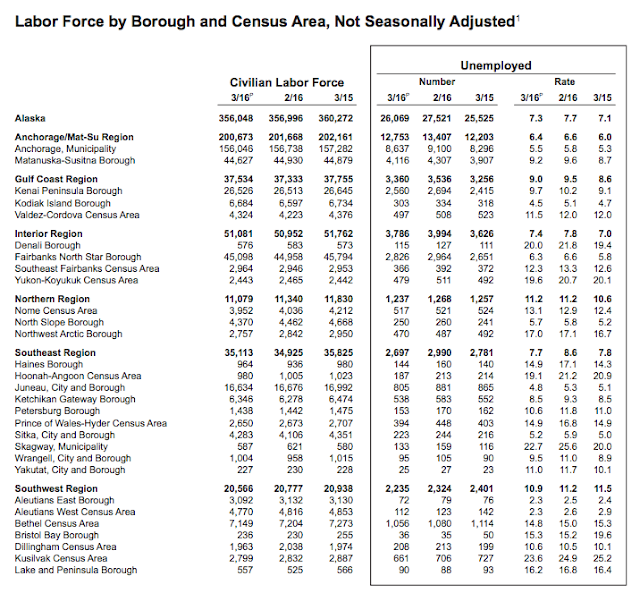 Unadjusted rates fell in all but three boroughs and census areas from February to March. Rates increased slightly in the Nome and Dillingham census areas and Bristol Bay Borough. The highest rate was 23.6 percent in Kusilvak Census Area. Aleutians East Borough and Aleutians West Census Area, where the winter groundfish season was in full swing, tied for the lowest rate at 2.3 percent. 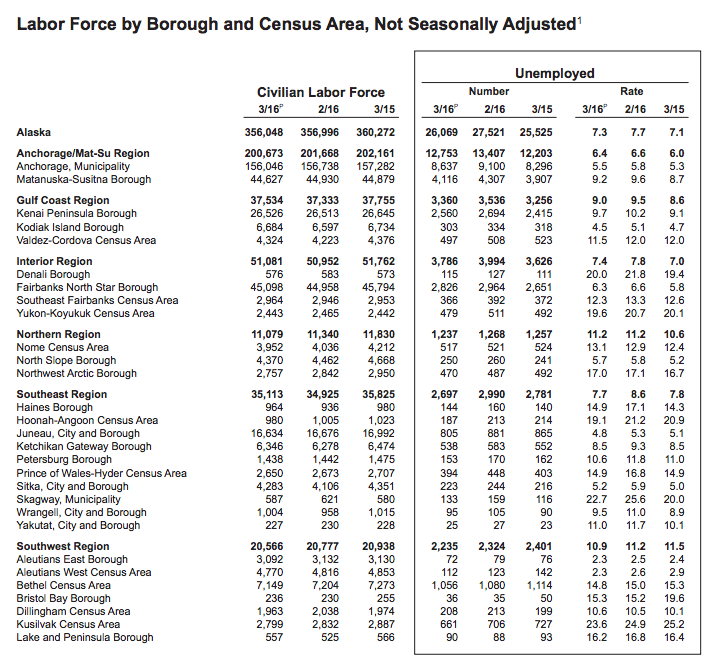 Preliminary employment estimates for March show a job loss of about 1,000 from March 2015. Large losses in the oil and gas and construction industries along with consistent, over-the-year declines in state government pulled employment below last year’s levels. Monthly employment estimates are subject to large revisions at the end of each year, particularly at the industry level. 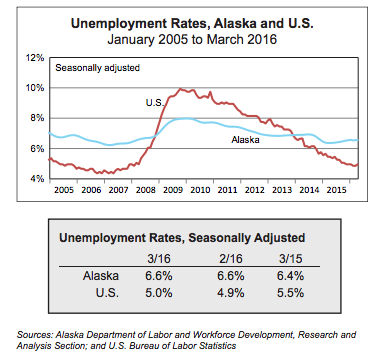 Does Anybody know why Sitka has such a low unemployment rate? Juneau makes sense because there are a lot of state employees there year round. However, Sitka seems to be the odd duck out.